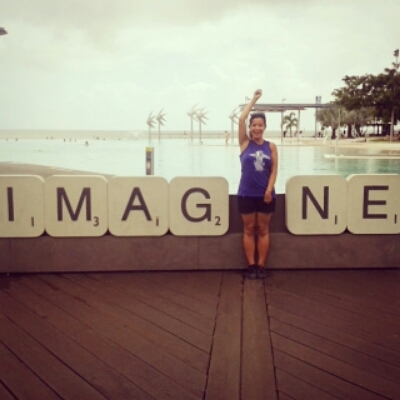 We were so happy to arrive in Cairns, even if it was 5am and a bit dizzly! It meant we had made it to the furthest north point of our trip in Australia and it was our last night bus for the time being. This particular night bus wasn’t too bad, we each had two seats to ourselves so we were able to sleep in foetal position. 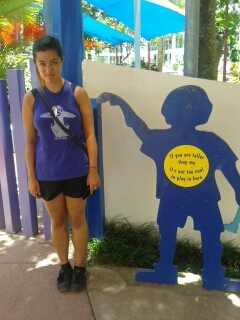 The perks of being short! After checking into Dreamtime, our new hostel for a couple nights the next thing we did may be frowned upon, it’s not exactly an attraction or traveller-esq thing to do in Cairns but at 10.25am I found out that ‘Wild’ (the new Reece Witherspoon film that I mentioned in my Ubud blog) was playing at a near by cinema in town… by 10.35 after running three blocks down the road we were seated. 🙂 Both Bekki and I had read the book during our travels so it made perfect sense! 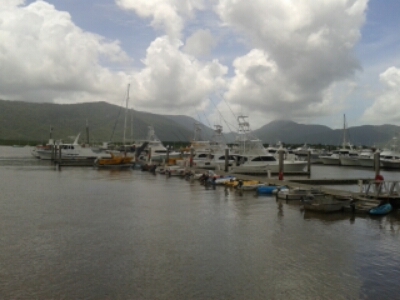 The rest of the day was spent seeking a Great Barrier Reef Tour for me to do the next day. But to be honest I was actually open to the idea of NOT doing the reef. The only reason I wanted to do it was because it was what you’re “meant to do in Cairns”, and I was only willing to spend $100 which only allowed me on the cheap tour where everyone goes and was described to me as the Oxford Street of the reef. You get what you pay for and the more expensive tours actually sounded more appealing but sadly I did not get the credit card out. That’s being saved for New Zealand. Also I had snorkeled the day before, seen dolphins, it was enough for me. So Bekki and I formed a plan, we Googled ‘Free things to do in Cairns’ – annoyingly everything involved a car. We instead did a walking tour of the Promenade and seeked out the Botantical Gardens and a red flag hike to the mountains. After walking around for an hour looking for this walk, we read a sign that said the Gardens were 4KM away – fail. Ok, just the promenade walk it is then which was nice but you can’t go on the beach because of crocodiles or in the sea because of deadly jellyfish so they built a pool. 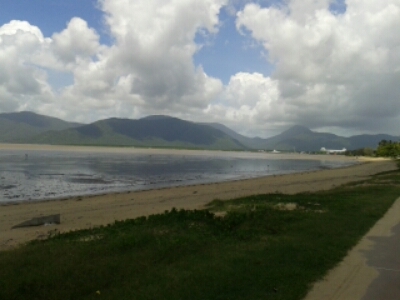 There’s also some nice mountains surrounding the harbour. 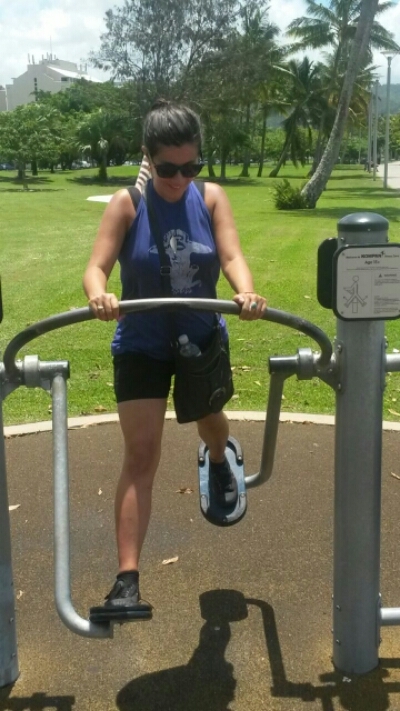 We ended up walking about 6/7KM that day and also had a work out on the exercise equipment across the beach. 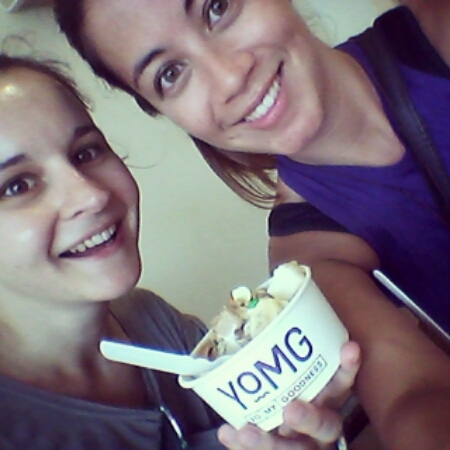 So at least we were keeping active and treated ourselves to frozen yoghurt. 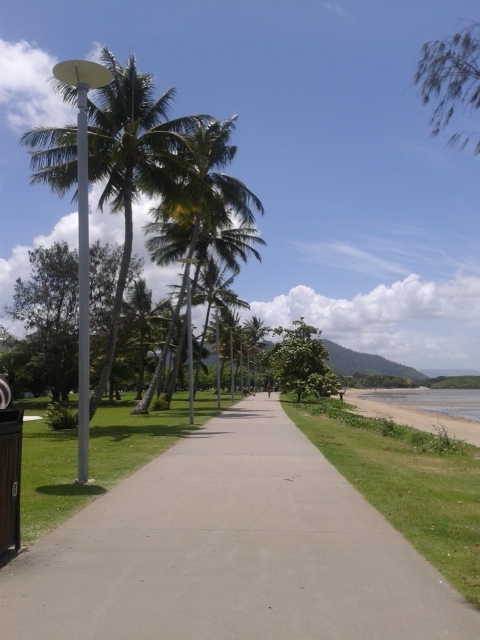 There are other things you can do in Cairns on tours like see rainforests and waterfalls – but we felt we did this on Fraser and also day trips to Darwin and Cape Tribulation but we didn’t have the time. 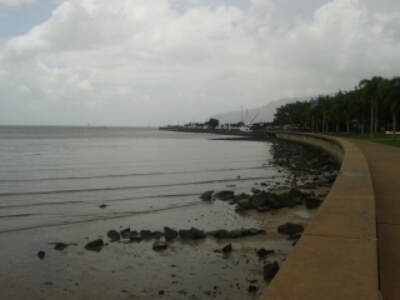 But we did see all of Cairns city. 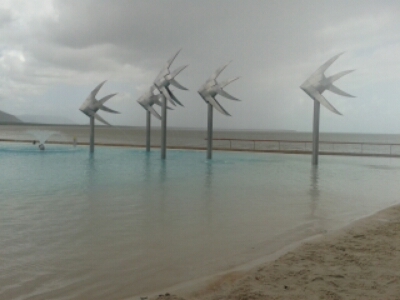 I expected good things from Cairns…a luxury beach city, beautiful sea coast, posh beach resorts etc. To be honest, I did not like Cairns as it seemed slightly outdated. The beach walk was nice, weather was good but in terms of the city you could walk around the whole area in a couple hours and it’s just shops like any other city. Cairns centre was so dull I didn’t take a single picture of the buildings. 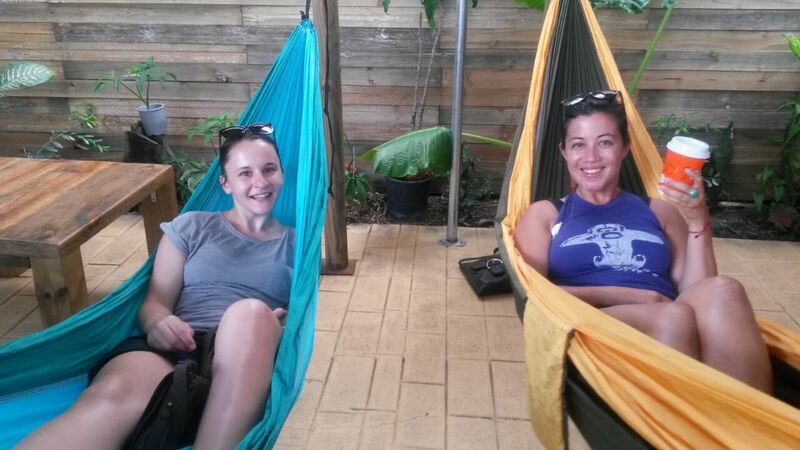 However we did find little hidden gem, Hammock Cafe, apparently the first Hammock Cafe in Australia. It was hidden down an ally way and was a good place to relax and… blog. I’m sorry if this Cairns blog is uneventful. But we did try and make the most of seeing the town. I personally would not return to Cairns unless it was to do the Great Barrier Reef and pay a bit more for a quality trip rather than a budget swim. We did have an eventful ending to our trip, on the morning of our departure our trusty Aldi Cool bag was missing from the fridge. 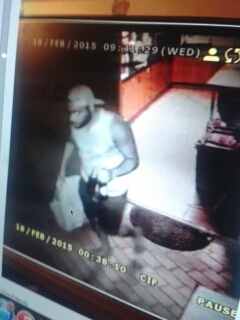 After checking the CCTV with reception, we found that two gentleman had broken into the hostel kitchen and stolen it!! All it had in it was some Tetley Tea bags, instant noodles and coffee. Hilarious. Lucky for us our chocolate TimTams were in our room.